“This region has the distinction of usually getting involved in responses to hurricanes, and last year we had the challenge of the oil spill, so what we’re hoping this year is that we’re disaster free for one year,” she said. Region 4 includes Alabama, Florida, Georgia, Kentucky, Mississippi, North Carolina, South Carolina and Tennessee. Following the massive Deepwater Horizon oil spill in April 2010, Region 4 helped reduce injuries and illnesses among the thousands of cleanup workers in Florida and Alabama. She noted that Region 4 devoted 12,500 regular hours and 11,953 overtime hours to that effort through October. “I think our biggest success was continuing to run all of our programs, continuing the reduction in fatalities, meeting all of our targets, and still managing to provide the level of support that we did following the BP oil spill,” Coe said. Focusing on construction hazards represents a major part of Region 4’s strategy. Last year, OSHA partnered with the Georgia branch of the Associated General Contractors of America to conduct safety stand-downs. During the voluntary work stoppages, construction companies provided safety training on topics such as cranes, fall protection and work zone safety. Feedback from employers indicates the stand-downs achieve their purpose of keeping employees focused on major hazards. “I think it’s part of the picture as to why we’ve been successful in this region in reducing the number of fatalities,” Coe added. Still, challenges remain. The Gulf Coast is subject to hurricanes and, in the aftermath, workers may be exposed to hazards during cleanup activities. What do they find? People tarping roofs without wearing fall protection and working in roadways without protection from traffic. The South also lacks a large union base, which Coe said makes it more difficult to get information into workers’ hands. So Region 4 uses other methods. Compliance assistance specialists go door-to-door making cold calls and providing information about OSHA. Coe said they often meet employers who have never had an OSHA inspection (or wanted one). Yet employers appreciate the opportunity to ask questions and learn about OSHA services. Coe said Region 4’s outreach program is built around small businesses. Those employers especially like the onsite consultation program; some have even written to thank the agency. “It has really made a huge impact in their business,” Coe added. In 2010, Region 4 had more significant cases than ever before, according to Coe. 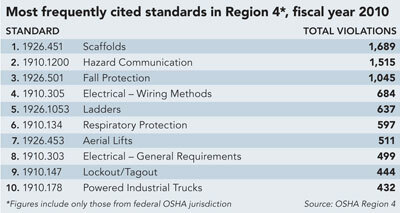 Three cases from the region made Safety+Health magazine’s top 10 list of OSHA proposed penalties. Looking ahead, Coe anticipates launching Regional Emphasis Programs on forklifts, methylene chloride, noise in general industry, and bloodborne pathogens in walk-in health care clinics.